The P90X Workout is the Cadillac of fat-burning and lean muscle shredding home workouts. It definitely has a place on my home fitness and exercise equipment list. There is one simple reason why the P90X Workout is a best-seller...It works! Sales explode year after year because people get results. 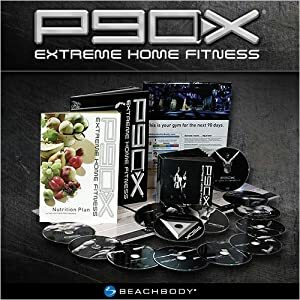 The P90X Workout is a comprehensive body transformation system. It comes with 12 radically different DVD's, a nutrition guide, and a workout calendar. The nutrition and the workouts center on a three-phase (30 days each) periodization protocol to ratchet-up your intensity as your become stronger and more fit. Women lose belly fat and thigh fat...and become slender, fit, and femininely toned. Guys lose male belly fat and become ripped and more muscular with the P90X Workout. If you follow the nutrition plan and are consistent with your workouts, you will definitely notice results, both on the scales and in the mirror. The P90X Workout is a proven program that will get you a body others want to touch.